DO YOU WANT TO KNOW OUR CONSULTING SERVICES? According to IDC, most companies plan to choose their SD-WAN solution before the end of 2019. 90% of companies will adopt the cloud, be it as infrastructure, cloud applications or some cloud service. This is a great challenge. SD-WAN solutions can help you in this way. In this article, discover the main benefits that a Cisco SD-WAN solution can bring to your company. The flow of data and devices is exceeding the limits of traditional WAN architectures, which makes it almost impossible for networks to keep pace. With the power of software-defined networks in the WAN, companies can improve performance, reduce costs and stay protected. SD-WAN is a software-driven solution that directs traffic, maintains application performance and adapts to changing conditions without direct supervision of the IT director. SD-WAN is a technology that helps simplify this adoption of the cloud. Next we will explain what SD-WAN is and how it helps companies to modernize their network, improve the user experience with applications, reduce costs and integrate with the cloud while increasing security. How do you work in traditional architectures? In traditional network architectures, the offices send all the traffic from the remote offices to the datacenter through an MPLS network provided by an operator. From the datacenter this traffic destined to the internet, goes through a centralized firewall. What’s happening? That with this massive adoption of the cloud what we are seeing is that between 50 and 80% of the traffic from these remote sites is destined for the cloud, therefore, it makes no sense to pass all this traffic through an architecture centralized firewall in the datacenter. On the one hand, we waste very expensive bandwidth resources and on the other hand, we are adding unnecessary latency to applications. All this influences the user experience. A possible solution to this problem is to enable direct access to the Internet to each of the remote delegations and not have to pass this traffic through the datacenter. We can use fiber, adsl, 4G … which gives us a lot of flexibility. But this poses certain security risks to be taken into account, as well as certain operational and configuration complexity. The solution is SD-WAN, since it allows to optimize the experience of the applications that go to the datacenter through the MPLS but also allows to enable those accesses in each delegation. Would you like to know more about SD-WAN? 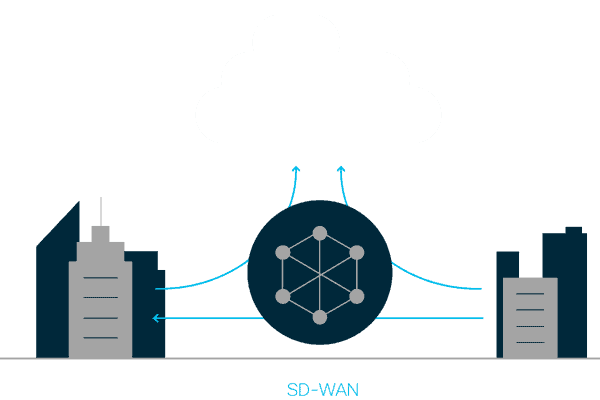 What are the benefits of the SD-WAN solution? Management from a simple and centralized console that can reside in the client’s facilities or in the cloud. This will provide us with simple workflows for configuration and for the detection and resolution of network problems. 2. Rapid site deployment and cost reduction. SD-WAN allows automated provisioning of equipment and the independence of the transport layer. We comment on these two characteristics: self provisioning allows opening a new headquarters without displacing a technician, simply by connecting the equipment to the Internet, the equipment will self-provision in a few seconds. On the other hand, the independence of the transport layer, gives us the option of having a 4G connection from the first day and not having to wait for the operator to provide us with the requested MPLS or fiber access. 3. Optimization of the user experience. SD-WAN chooses automatically and completely transparent for the user the transport that best suits the applications we are using. It takes into account parameters of latency, jitter, packet loss … Voice traffic that requires certain maximum latencies is not the same as video traffic, which is more permissive with latencies but requires packet losses Very low. SD-WAN provides analytics and thanks to them we obtain a greater visibility of the entire network, of bottlenecks that we can have in each of the delegations and we will be able to optimize it and anticipate any problems that may arise in the future so that Do not impact our business. Optimization of applications and workloads. SD-WAN integrates security in the routers that are located in the offices. Integrates security at the level of application firewall, IPS or intrusion protection system, URL filtering and Cloud security with Cisco Umbrella. Thanks to all this security functionality integrated in the router itself, we will be able to enable security in each internet access of each delegation. Cisco Webex® Room Kit Mini is a videoconferencing system based on Artificial Intelligence (AI). Custom designed for the group work style. It is easy to use, implement and manage. Combine the codec, camera, microphones and speakers in one device. If you have a 4K screen in a room, turn it into a collaborative meeting space! What size of rooms is recommended? The Room Kit Mini is ideal for meeting spaces of three to five people. It has a wide field of vision of 120 degrees that allows to see everyone in a meeting space. Use Artificial Intelligence (AI) to make sure everyone can see and be focused. It also offers the flexibility to connect to a video conferencing software based on a laptop via USB. CISCO WEBEX ROOM MINI is tightly integrated with the industry-leading Cisco® Webex platform for continuous workflow, and can be registered on-site or to Cisco Webex in the cloud. Room Kit Mini offers the industry leading collaboration experience, whether you are in a meeting space or in a corporate boardroom. Implementation and administration capabilities are easy and allow customers to equip and support thousands of meeting spaces with intelligent collaboration tools typical of larger room systems. Important to note that people who use the system, are taken into account to perform analyzes on the use and used to plan resources. These features allow Cisco to eliminate usage and deployment barriers, and enable today’s new meeting work style. Brings more intelligence to the way of teamwork. Cisco Webex Room Kit Mini offers collaboration innovation in a Kit. It brings intelligence and ease of use to meeting spaces. Other vendors are striving to embed advanced features such as automatic framing, wireless sharing and 4K content into their high-end products, while Cisco already incorporates them into the full range of equipment. With the Room Kit Mini, Cisco is helping customers experience smart meetings, smart presentations and creating smart device and room integrations at a competitive price. Smart meetings: Powerful built-in cameras offer intelligent viewing capabilities, such as auto-framing, and automatic noise suppression functionality reduces meeting disruption. Smart rooms: People count for usage metrics and resource allocation; Narrow integrations with screens improve user interactions; APIs and macros allow the personalization of meetings. Record flexibility: Created for deployment in the cloud and on the premises, protecting your investment. Join any meeting: A USB connection allows interoperability with any cloud service provider. These features were previously high-end video conference rooms. Now they can be taken to all rooms and equipment. 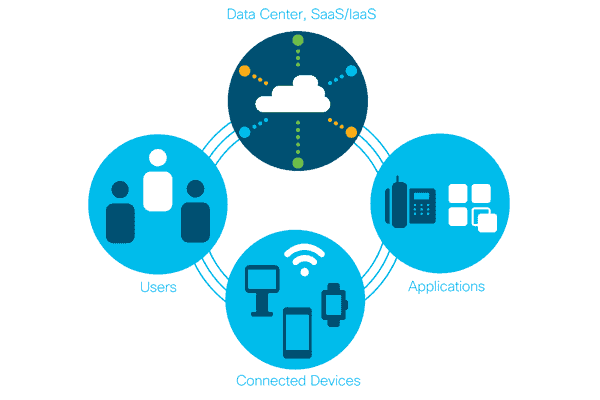 And when it registers with Cisco Webex, additional cloud-based functionalities are enabled that improve the user experience and workflow of the team and further simplify implementation. On February 24, 2019, Solutel has once again validated its Advanced Security Architecture Specialization certification. This specialization supports the technological and professional knowledge of Solutel for the definition of complex security architectures based on CISCO solutions. Due to SOLUTEL’s awareness of security issues, it has always been committed to offering innovative products and services to prevent cybersecurity problems that have evolved in recent years and that many economic problems and service disruption are occurring in many companies. . The solutions in security is a fundamental pillar in the design of all the solutions that SOLUTEL presents to its clients. Offer professional support services for the wide range of security solutions offered by CISCO. As a result, we can affirm that SOLUTEL has a highly qualified team of professionals in CISCO solutions, both at the pre-sale level of the solution design and at the technical level in the implementation and support. We are pleased to inform you that since February 27, 2019 we have moved our facilities in Madrid. From our new facilities we want to improve our service and attention. Do you know the most common tactics that hackers use to endanger your system? How to stop the execution of these files? We are making our device vulnerable to ransomware. These are just some of the many ways in which ransomware can be introduced into our device. On the other hand, malvertising, emails with identity theft, and even memory cards are the common tactics that hackers use to compromise your system. How to stop the execution of these files? Umbrella protects your system by blocking the file request according to the encryption key infrastructure. This implies that the ransomware can not communicate or obtain the necessary information to encrypt your data. At the same time that Umbrella blocks the request, Cisco’s next-generation firewall will block the connection, which offers additional protection. If a file manages to pass the DNS layer and the firewall, the protection against advanced malware (AMP) of Cisco for terminals can block the execution of the file and go a step further. It continuously analyzes all file activity in the system and offers you the ability to locate and remove all malicious files. CISCO AMP for terminals, prevents attacks and blocks Malware at the point of entry. Cisco Meraki announces the end of the sale for the next product MX65 and MX65W. The security devices managed in the cloud MX65 and MX65W have been replaced by the MX68 and MX68W, which have more capacity at the same price. Comment that there are two types of licensing in MX. The Enterprise license and the Advanced Security, with option of 1, 3, 5, 7 and 10 years. Next-generation firewall, layer 7 “next generation” firewall, gives administrators full control over the users, content and applications of their network. Intrusion prevention, based on SNORT®. Centralized and simple management of all firewalls from a single administration portal. It is 100% managed in the cloud, the installation and remote administration are very simple. Management of VPNs extremely simple and automated and without additional costs per user. Optimization of traffic between sites with data compression saving bandwidth and increasing speed. Prioritization of traffic by applications to optimize the use of the Internet. Integrated reports in the management portal, without the need for additional installations. At Cisco Live EMEA 2019 – Barcelona, ​​attend customized presentations and tours of the fair for our market from February 28 to February 1. In this edition of Cisco Live 2019, SOLUTEL will participate in a special way through two of its clients. We will keep you informed! It will be a unique experience in which we will combine the possibility of attending the main sessions of Cisco Live, demonstrations, meetings with experts and training along with a customization for our market designed especially by Cisco Spain. Cisco Live is widely recognized as the leading event of training, inspiration and connections for technology professionals. It presents a unique opportunity to acquire state-of-the-art knowledge and skills about the technologies we already use, through the speeches of Cisco visionary and executive thought leaders, in their more than 700 networking sessions. By attending Cisco Live, you can receive training in a single week that would otherwise require multiple courses and sessions throughout the year. The ability to personally evaluate the latest innovations in networks, security and the cloud. To better understand emerging technologies and concepts that are the driving force behind the new and innovative world of digital business. Meet directly with Cisco experts and ask questions about our unique challenges. Connect with other Cisco attendees and partners to hear their perspectives and suggestions on best practices, new ideas and new tools we might consider. The bottom line is that by attending Cisco Live, you turn attendees into a more valuable asset for your organization, and that will help us get more information about our investment in Cisco and other technologies. The Technical Training program is organized by Technology Tracks and learning routes to help you easily find the sessions that are most relevant to each attendee.